British shoegaze pioneers Ride are coming to North America for a handful of dates ahead of their first new album in 20 years. The band has lined up a short leg of concerts for the month of July, with Toronto, Boston, New York, and Philadelphia among the cities included on the upcoming itinerary. Ride’s forthcoming album serves as the long-awaited follow-up to 1996’s Tarantula. It features production from Erol Alkan (Franz Ferdinand, Kindness) and mixing from Alan Moulder, who worked on Ride’s first two LPs as well as releases from Arctic Monkeys and The Killers. Thus far, the UK outfit has teased the as-yet-untitled LP with a pair of songs in “Charm Assault” and “Home is a Feeling”. 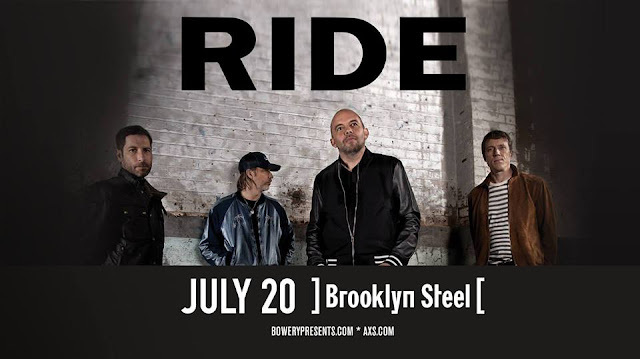 July 20th, RIDE will debut new material at Brooklyn Steel. RANTS AND REVIEWS. Anti-Pitchfork © 2011. Simple theme. Powered by Blogger.